Domince is working class suburb on the eastern side of Korcula Town. There is a large part of Domince that is actually council estate, built in 1970’s and 1980’s as cheap housing for workers in local factories and companies. That part of Domince is locally called “Pejton“. It is featureless, dystopian estate, about 1/2 hrs walk from the Korcula Old Town. There is a regular bus service that connects Domince with Lumbarda and Korcula town . Area next to Domince is Pod Sveti Anton. Domince is also known as a ferry port where car ferry from Orebic arrives and where Korcula Petrol Station is located. 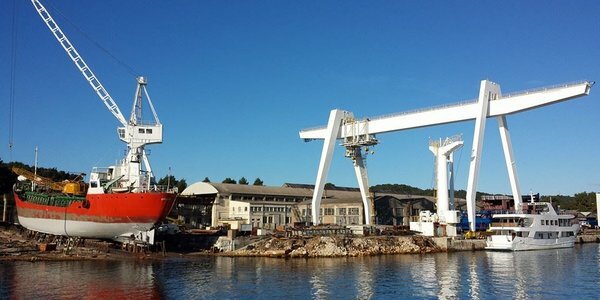 Local shipyard (shipyard Leda) is also located in this area. Click on above image to enlarge 3D map od Korcula and surrounding area that includes Domince. Note: Popular venue in Domince is Peco’s Pub – the lively place to spend Friday nights in off season.